First posted on April 9, 2009. 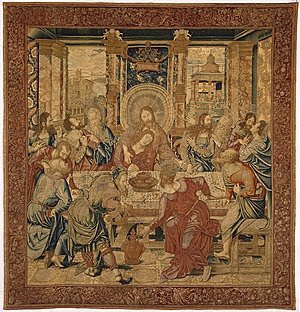 From da Vinci's famous masterpiece in Milan to Ghirlandaio's in Florence, scenes of Jesus gathered at a table with his disciples -- the Last Supper -- are commonplace in Christian art. 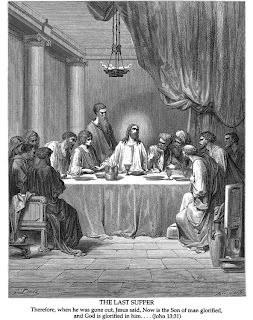 In the Christian tradition, today is Maundy Thursday: the day when the Last Supper is commemorated. Jesus and his disciples were Jewish and they gathered together for Passover. During the Sedar meal, Jesus took a piece of the traditional, unleavened bread and gave it to his disciples saying, "This is my body given for you. Do this in remembrance of me." He also took a cup of wine and said, "This is my blood shed for you and for all people. Do this in remembrance of me." This tradition of sharing the bread and the wine together is the beginning of the Christian practice of Communion. And it is this moment in the Christian story which is depicted in the Last Supper. And this is why in many churches children will gather to take their First Communion tonight. While there are many more famous depictions of the Last Supper (in Italian L'Ultima Cena or il Cenacolo), one of my favorites is in the Sistine Chapel in Rome. When the chapel was completed in 1480, Lorenzo de’ Medici sent Florence's finest frescoists to work on the Sistine Chapel -- a peace offering to the pope. Pietro Perugino, Sandro Botticelli, Cosimo Roselli, Luca Signorelli, and Domenico Ghirlandaio (Michelangelo’s future teacher) drew inspiration from what they saw in Rome as they created the rich and colorful frescoes on the walls. Like the painters of the Domus Aurea, the Florentine frescoists divided the long space of the Sistine Chapel’s walls with faux architecture, creating form and space from a flat wall. They employed fanciful and imaginative motifs from the Domus Aurea in their paintings, and set the stories they were telling among the ruins of Rome and in buildings resembling the rooms of the Domus Aurea. Their scheme for the Sistine Chapel reflected the purpose of the room. Below Piermatteo d’Amelia’s blue sky was a tier of ancient popes, reminding the conclave of the historic and spiritual nature of their electoral task. Beneath the row of popes, in a band that extends all the way around the chapel, the painters depicted scenes from the lives of Moses and Jesus, the two most important figures in the Old and New Testaments. Each event from Moses’s life was paired with one from Jesus’s life, illustrating the parallels between their lives. The cycle continued around the chapel, with each panel facing the corresponding panel on the opposite wall. The scheme also drew connections between the Old and New Testaments, the old covenant symbolized by circumcision (The Circumcision of Zipporah) and the new by communion (The Last Supper). Before I take a group of travelers into the Sistine Chapel, I always talk about what they are about to see -- the dramatic frescoes on the ceiling and the walls -- and the organization of the ideas therein. Walking into the chapel for the first (or even the hundreth) time is a profound, astonishing event. But once you stop and look -- truly look -- there are little gems everywhere you look. And I am particularly fond of Rosselli's Last Supper which is on the north wall of the chapel at the back of the room. 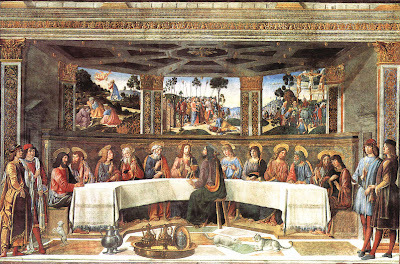 Rosselli depicts Jesus and his disciples at a long, curved table. Judas, the disciple who betrayed Jesus, sits opposite of Jesus with a small demon perched on his shoulder. This is all fairly standard fare for a Florentine Last Supper. But there are also some interesting touches worth a harder look. In front of the table a cat and a dog are squared off, fighting over a bone. One one side two gentlemen dressed in Florentine clothing (not Biblical attire) are surveying the scene while on the other side of the fresco two Florentine gentlemen watch the viewer. But Rosselli does not just limit himself to the events at the Seder table. If you look out the windows in the composition, other images from Maundy Thursday are apparent: Jesus and his disciples in the garden and the arrest of Jesus. After Jesus and his disciples left the meal, they went to the Garden of Gethsemane. There they spent time in prayer and then Jesus was betrayed and arrested. If you look closely, you'll see that the soldiers' shields have "SPQR" written on them in the depiction of the arrest. Jerusalem had been conquered by the Romans, so this is historically accurate, but it may also have been a political dig from a Florentine, too. In the third window, Rosselli depicts the Crucifixion, an event which took place the next day and which I'll write about tomorrow. But tonight as you gather together for a meal whether you are celebrating Holy Week or Passover, I wish you a week that is meaningful and fulfilling.